St. Germain, Champagne or prosecco, and soda water. Lightly effervescent, slightly inebriating, and thoroughly enjoyable. 1. Combine all of the ingredients over ice in a Collins glass, highball glass, or glass tumbler. 2. Stir gently and garnish with the lemon twist. 3. Start sipping immediately (as if we had to tell you that!). This St. Germain cocktail was totally easy peasy—easy to make and easy to drink. This is a wonderful cocktail! Cool and refreshing. Perfect for an afternoon in a hammock. This St. Germain cocktail is a perfect summer cocktail with lovely floral notes from the St. Germain. It takes only a few minutes to assemble. I used a vegetable peeler to get that nice, wide slice of lemon zest. This St. Germain cocktail is a super straightforward and refreshing drink that got a thumbs-up from both of us. I hadn’t used St. Germain before but suspected the elderflower liqueur would work as I have used other elderflower cordials and syrups to flavor sparkling water. The combination of the dry sparkling wine and the St. Germain was lovely with the soda as a long sipping drink over ice. The perfume of the elderflower really is very nice. This is a nice drink to share with friends. 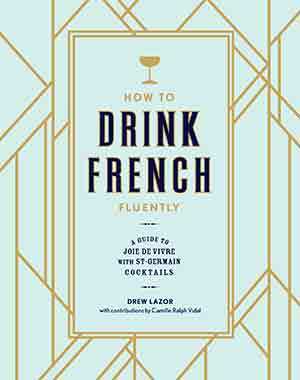 St. Germain Cocktail Recipe © 2017 Drew Lazor | Camille Ralph Vidal. Photo © 2017 PUNCH Creative. All rights reserved. All recipes and photos used with permission of the publisher.